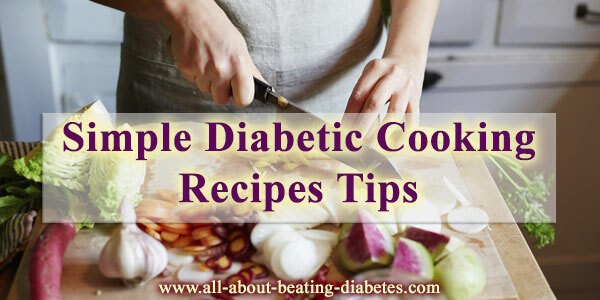 This section is created to provide some simple recipes tips on how to cook diabetic foods. This will ensure to get the right nutrients you need in the healthiest way. To me, cooking is a special Art that not everyone can achieve. Nowdays, there are people who love to cook and can cook really good; but do not have time. On the other hand, there are some other people who do have the time, but cannot cook. So, to make it easier for you to follow, I have divided it into four sections where you can find cooking tips on different variety of foods and herbs. The first section include cooking tips of different dishes of vegetables (cooked or salads). This section provides some simple tips on how to cook different herbs that can benefit diabetics. In addition, you will learn that some preparation methods like frying would destroy the nutrients, so you cannot take the best results. These recipes are very easy to follow and do not require "cooking skills". You just need to have water and the right herbs to prepare the teas. While shopping, you could be in doubt which food to choose. I have tried to create some lists of top foods that contain the right vitamins diabetics lack and mostly need. You will see that they are the commonest food you can find in the market but you could have ignored their importance and nutritive components.